Top grain leather, metal soul, curved back for more support. Available in stainless steel legs or wrapped on leather. Colors: Black, Mink, White, Gray. American Walnut. 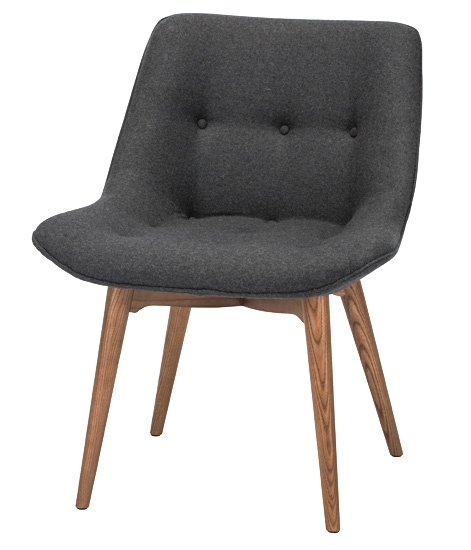 Available in padded top grain leather and in natural or dark walnut. Engineered to be used for years to come indoors and outdoors with its anodized aluminum frame. This classic inspired dining chair is constructed using a solid brushed aluminum tube frame with welded joints. The seat is also given a formed seat with a slightly curved backrest for optimum comfort. Elegant nickel plated metal rod dining chair with wool boucle cushion. Also now available with plated gold frame or painted matte black frame. The Eiffel Chair is a great example of functionality and form in one. With a strong yet flexible polypropylene seat, perfectly contoured for maximum comfort, the Eiffel Chair combines minimalist design with a perfect ergonomic shape. The profile is striking, combining bright colours with a graphic tower frame to create a look that is classic yet contemporary in any setting. Available in a metal or wooden base. A large selection of Fabric and PU Leather make this line versatile and well suited for both Residential and Commercial applications.